As the Economist puts it, "Consumers often struggle to realise, for example, that a 50% increase in quantity is the same as a 33% discount in price". These calculations are directly analogous to the calculations needed to estimate savings in mileage and in gas consumption. A 50% increase in mileage is the same as a 33% reduction in gas use. For example, a 100% increase in MPG reduces GPM by 50%. 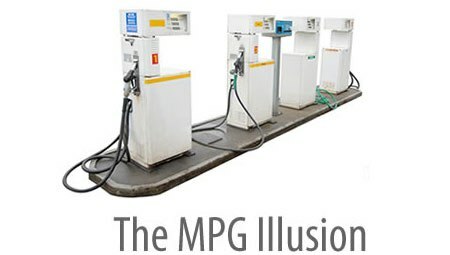 A 50% improvement in MPG reduces GPM by 33%.